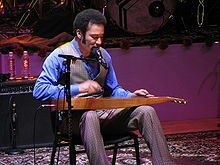 For other people named Ben Harper, see Ben Harper (disambiguation). ^ a b c "Ben Harper Biography". Rolling Stone. Retrieved November 6, 2015. ^ Dye, David (May 8, 2009). 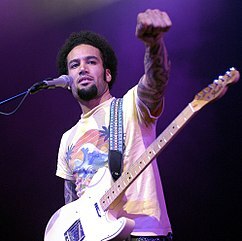 "Ben Harper Explores Rock With Relentless7 : World Cafe". npr.org. World Cafe (WXPN). Retrieved September 7, 2015. ^ Pulvirenti, Angela (August 19, 2007). "Ben Harper interview". Nine MSN (music). ninemsn Pty Ltd. Archived from the original on August 19, 2007. Retrieved November 6, 2015. ^ "Ben Harper". Discogs. Retrieved November 6, 2015. ^ a b Stutz, Colin (February 23, 2015). "Ben Harper is Married, Reunites The Innocent Criminals". Billboard. Retrieved November 6, 2015. ^ "Grammy nominations and wins - Ben Harper". Grammy. Retrieved January 29, 2019. ^ "BobMarley.com | Ben Harper Discusses Bob Marley". YouTube. May 17, 2012. Retrieved September 7, 2015. 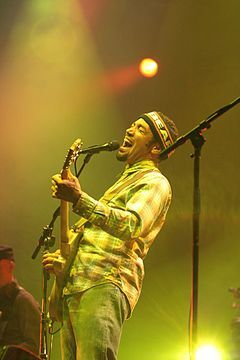 ^ "Ben Harper - Biography". Billboard. Retrieved September 7, 2015. ^ "Ben Harper Biography". Starpulse.com. October 28, 1969. Retrieved September 7, 2015. ^ ""For What It's Worth," No Nukes Reunite After Thirty Years". NukeFree.org. Retrieved September 7, 2015. ^ Chris Roberts & Roger Bagley. "16 - Ben Harper". The Nine Club With Chris Roberts (Video). Google Inc. Retrieved September 28, 2016.